Think about the time your child threw a shoe into the toilet, causing a flood throughout the entire bathroom. Maybe your husband used the bathroom. We’ll just end it there. The point is that water damage can happen at any time and there is nothing we can do except clean it up and stop the mold. Some people have near panic attacks when they call our Water Damage Connecticut team but is it really so bad? 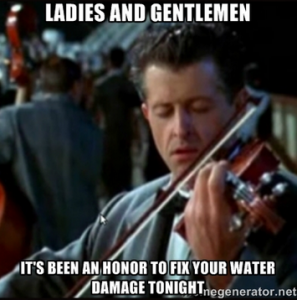 At least you weren’t on the Titanic. How Severe Can Water Damage Become? Jack and Rose had to quickly (attempt) to escape the Titanic from ice cold water. But was it water they were running from, or water damage? Truth be told, water damage is no joking matter. When water gets inside hardwood or walls, bacteria forms and this is a huge problem. Parents on the Titanic had to hold their children up over their head before water came crashing in. If you let water damage sit in your home, you’ll be carrying your kids straight to the ER. Never hesitate to call a professional when it comes to water damage. We are all aware that water comes from natural disasters along with clogged toilets and pipe bursts but it’s handling it that becomes a problem. There is no need to hop into a lifeboat and sail away. Call on our Water Damage Connecticut professionals for quality water extractions. We can easily get into crawlspaces and hard to reach areas. Could the captain of the Titanic do that? No, so we won’t let you drown. We use cutting edge technology and have a proven track record of removing water and mold from any household or business. Who knows if mold was harvesting through the Titanic but it can sure be infesting your home. We understand the illnesses that can form with mold and how damaging it can be to a household. This is why we come in immediately for mold removal services before your family is harmed. Along with fast and professional water removal, we have a devoted team who can dry out your home so you can go ahead and finish watching Titanic.